For over 40 years we've been providing basement, foundation, and waterproofing services across Nova Scotia including: Bedford, Sackville, Dartmouth, and Halifax. 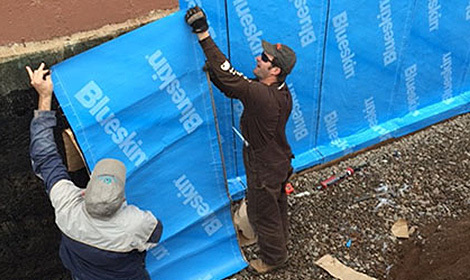 We install a structural waterproofing membrane which will effectively seal your foundation walls permanently for the life of your home. Our Hydraway system is the combination of two superior Hydraway products that creates the most effective and state-of-the-art internal waterproofing system offered. Cracks are common near breaks in the wall (like windows and beam pockets). Proper repair requires that the cracks be fully filled with epoxy resin or urethane foam. We offer a wide range of products and solutions to keep water and humidity out of your crawlspace such as high humidity condition alerts. Molds produce allergens substances that can cause reactions nnd in some cases potentially toxic substances (mycotoxins). Contact Us for your free inspection. We offer many solutions for your wet, leaky basement or cracked foundation. We provide both interior and exterior waterproofing services. For cracked foundations we offer crack-injection, wall stabilization and complete foundation repair. For the water in your basement we provide sump pumps, backup systems and inside draintile. Our work is guaranteed for the lifetime of your home.